Eligibility: Athletes of all ages are eligible to compete in this event. 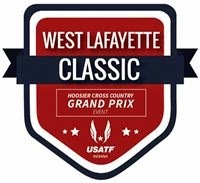 Hoosier XC Grand Prix Eligibility: Only USATF members will earn Hoosier XC Grand Prix points. ***Race Day Registration Is Available! 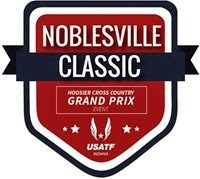 Congratulations to Jerry Donahue and Evan Acher for competing in today's USA Track & Field's Noblesville Classic XC event at Guerin Catholic HS in Noblesville. 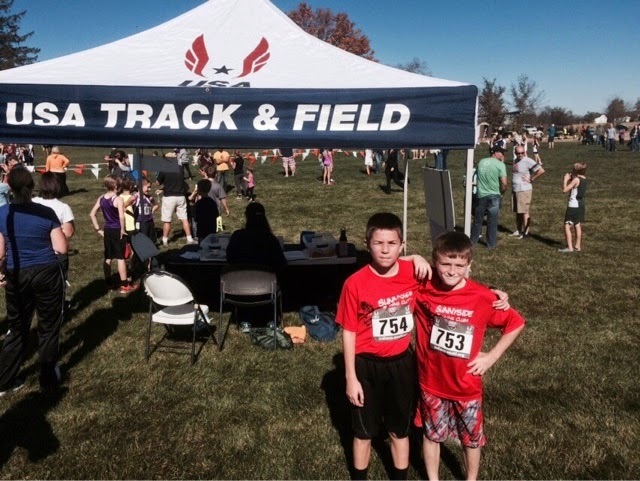 I'm proud of you guys and I look forward to seeing you both at the next USATF Youth XC event in West Lafayette next weekend. Registration: Entry List Online Registration is closed. Registration for both the fun run and the marathon will be accepted Friday evening or Saturday morning. 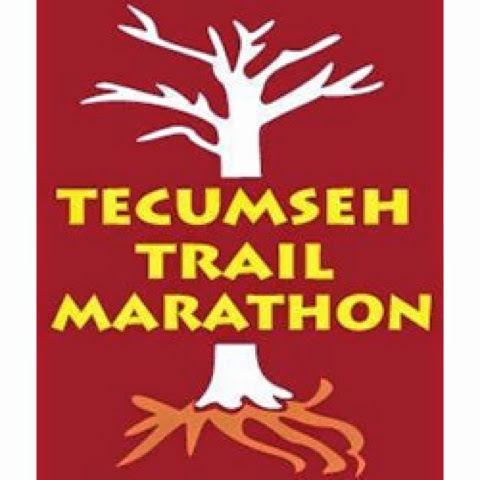 Good luck to everyone running this great event this year. With it's new time slot, the usual snow and cold is sure to be gone. Date: Saturday, Oct. 25, 2014. 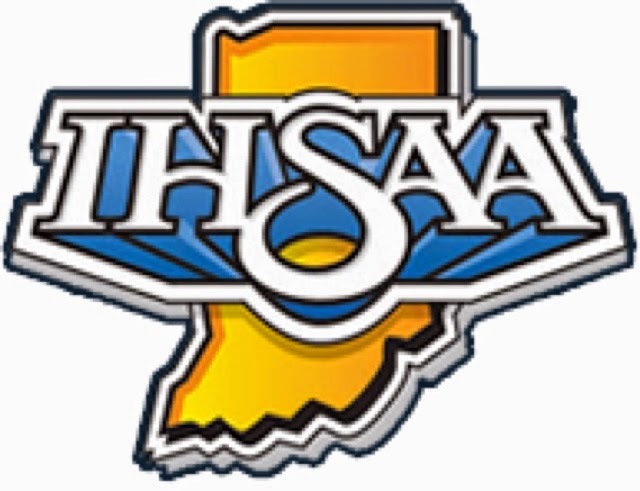 Advancement: – The top 10 individuals from non-advancing teams and the first 6 qualifying teams from each semi-state shall advance to the state finals. Feeder Regionals: Ben Davis, Noblesville, Rushville, South Dearborn. Good luck to all local runners this weekend! 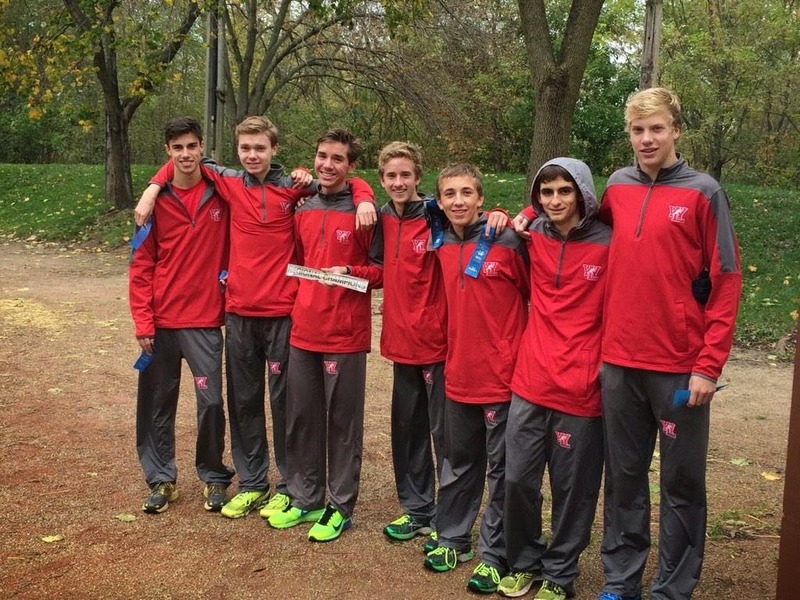 West Lafayette XC: Boys put 7 in the top 16 to claim the regional title with 20 points. 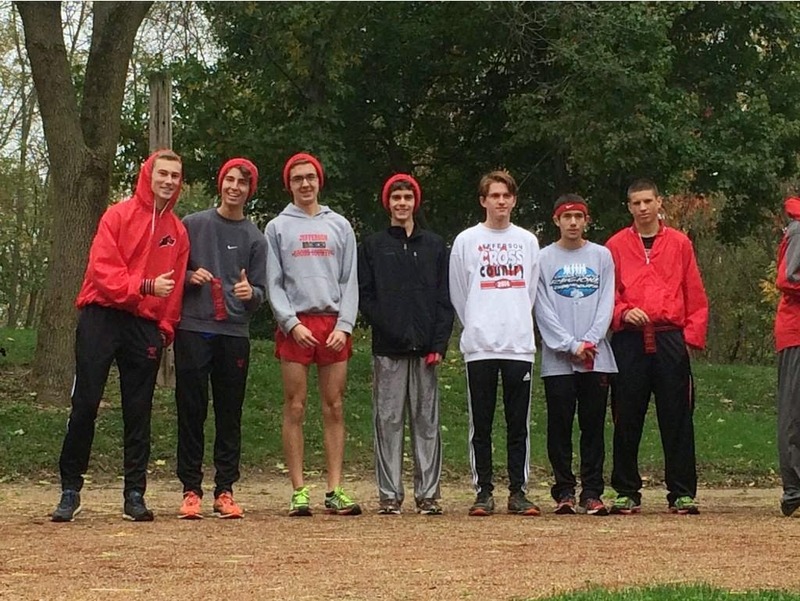 Lafayette Jefferson: Boys 2nd at the regional & qualify for the New Prairie semi-state. Girls have a great season that comes to a close. Congratulations to everyone who completed either the 5K or Half Marathon today! 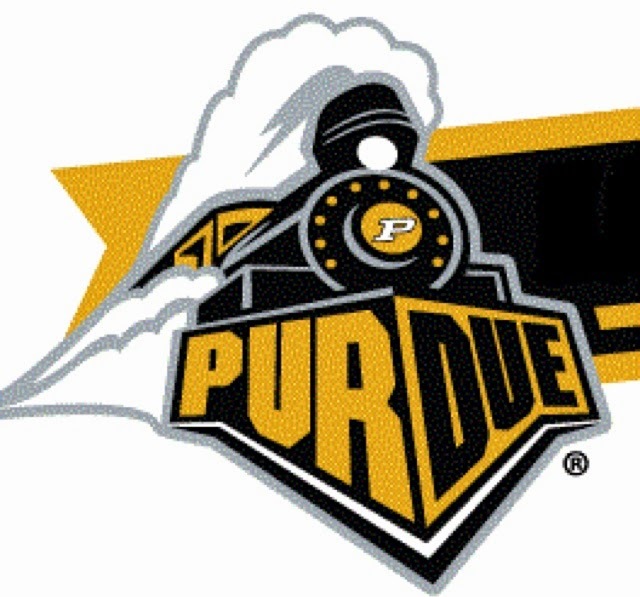 Purdue Boilermaker Half Marathon & 5K is tomorrow!!! Good Luck to everyone that has trained so hard for tomorrow's events. Don't forget to get there early, stay late and have a great time. * Special at today's event is the addition of two Kids Run distances for age divisions of 8 & under and 8-12 years. Submit a before and after pic of yourself for a chance at a free entry next year! See TuxBro Facebook for deets! 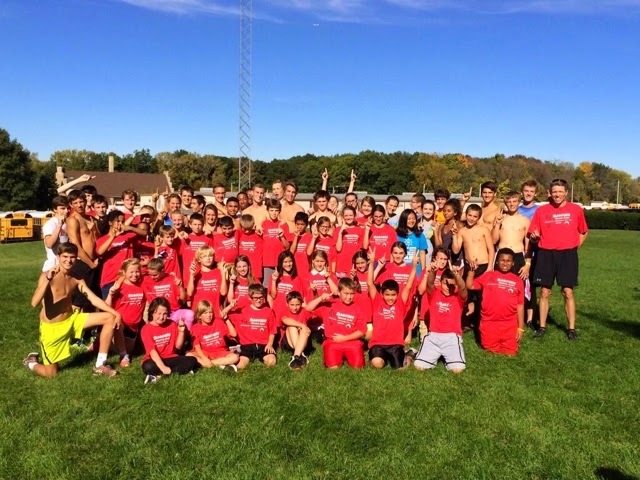 Checkout this terrific XC running/racing opportunity. The inaugural Hoosier Cross Country Grand Prixkicks off next Sunday, October 12 with the Shelbyville Classic in Shelbyville, Ind. The entry deadline is Thursday at 11:59 pm. To enter visit the Shelbyville Classic website. To learn more about the Hoosier XC Grand Prix click here. "We are excited to be able to showcase our new cross country venue in Shelbyville to athletes from across Indiana," stated Shelbyville Classic event director Gary Nolley. 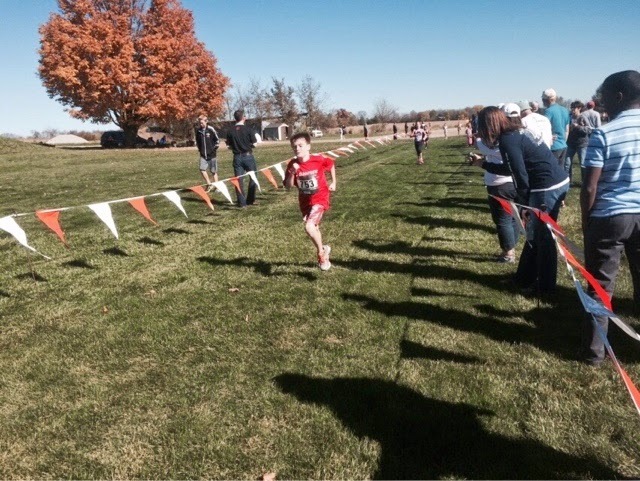 "The Hoosier XC Grand Prix offers a great opportunity for athletes of all ages and abilities to come together and celebrate cross country each weekend." 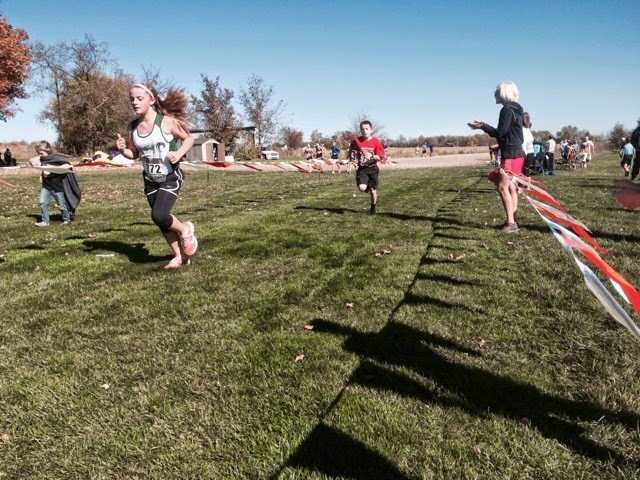 The Hoosier Cross Country Grand Prix is a series of six cross country events with events being held each weekend through November 15. The first 5 events are "Classic" events with the final event being the Indiana Association Cross Country Championships. The final event, worth double points, will be the USATF Indiana Association Cross Country Championships on November 15 in Carmel. Each event is open to all athletes with USATF Indiana members earning Grand Prix points that will accumulate towards a year-end point total. Following each event the current grand prix scoring for each age division will be available on the USATF Indiana website. More details on the Grand Prix including the scoring rules can be foundhere. "We are happy to provide additional competitive opportunities for runners of all ages and are thankful to the local event organizers for staging the meets," offered USATF Indiana Long Distance Running chair John Maley, "In the coming years we will look to expand the series to more communities and areas of the state." 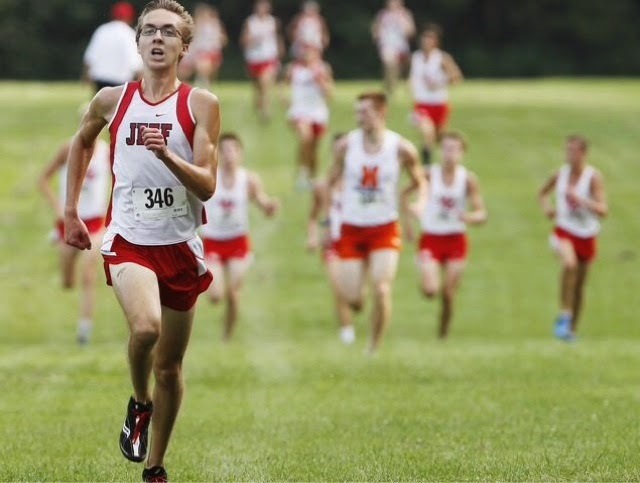 Led by Daniel Feltis’ winning time of 16:32.9, Lafayette Jeff celebrated its return to the North Central Conference by capturing the boys cross country championship Saturday. Shane Shipley, Clayton Slake, Zach Vandievier and Leo Bernier also finished in the top 12 to claim All-NCC honors. The Bronchos’ Dave Howell was named coach of the year. Lafayette Jeff scored 31 points to runner-up McCutcheon’s 88. The Mavericks received all-conference efforts from fifth-place Adam Fields and sixth-place Justin Berryman. Harrison made it a Tippecanoe County sweep of the top three, led by Charlie Brinkerhoff’s All-NCC run of 17:11.7, good for 10th place. In the girls race, Harrison was runner-up to Huntington North 22-69, led by Erin Dark’s fourth-place run of 20:18.2. McCutcheon was third with 86 points thanks to Shalynn Newkirk and Katelynn Hanback finishing 11-12. Lafayette Jeff was sixth, led by Cecily Cavenaugh’s 19th-place run of 21:55. The second-ranked West Lafayette boys and the 10th-ranked Red Devil girls once again swept the league titles. Travis Shinsky and Andrius Kriauciunas finished 2-3 for WL, which didn’t run its full varsity lineup. Benton Central’s Akis Medrano won the individual title in 16:46.63. Lauren and Kristen Johnson’s 1-2 finish in the girls race paced five Red Devils in the top 10. Behind the 2-3 finish of twins Hana and Haley Heide, North Montgomery defended its girls championship by outpointing Frankfort 34-82. Madison Pinkard and Courtney Clark also recorded top-11 finishes for the Chargers. Crawfordsville freshman Maddy Hurt won in 21:22. Danville captured the boys title with 48 points, 19 more than Southmont. Frankfort senior Cody Bray was the overall champion with a time of 17:11. 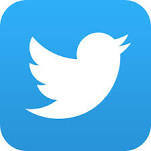 *** I'f only it were this easy! Of course, life is lived between the start and finish lines. There are no shortcuts! 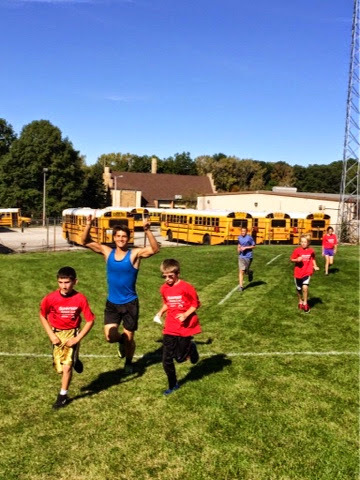 This week marks our 7th and final week of our Lafayette Sunnyside Intermediate School Intramural Cross Country Club. 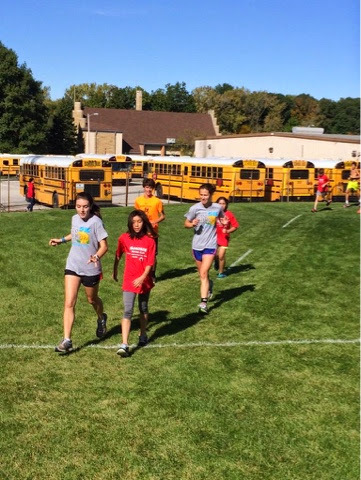 We've had a great time learning the sport of XC and working all our different styles of workouts (speed-work, endurance, time-base, distance-based, etc). And, we've especially had fun hanging out with our friends. 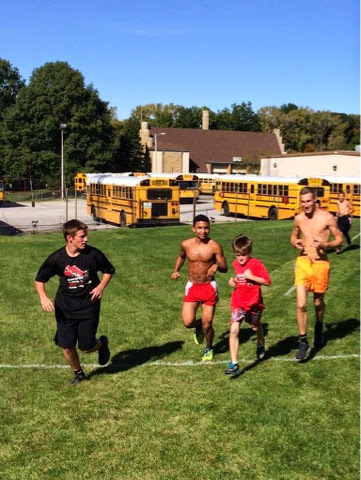 As a special treat, we got the chance to run with the Jefferson High XC Team yesterday. Strangely enough, some of our fastest times were reached with the Jeff runners present. Thanks goes out to Jeff Coaches Howell, Blocher & Fischer for taking the time to inspire us. Special Thanks goes out to Mr. Bennett and Mrs. Beasley for all your contributions to this program. Your assistance has made all the difference.